Deeply fragrant pale pink flowers open around Christmas time and fill the air with their glorious perfume in the depths of winter. 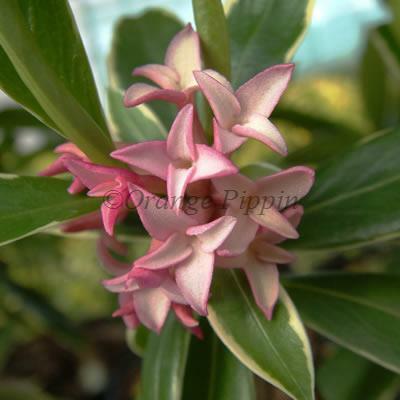 Daphne odora 'Aureomarginata' is an evergreen shrub of a rounded, slow growing habit with narrow, dark green, glossy leaves which have a striking yellow margin, becoming cream as they age, and will brighten up a winter's day in the garden. This highly attractive shrub is a marvellous addition to a sunny or semi-shaded border and its slow growth habit makes it ideal for a large container on the patio, where the scent can be enjoyed up close.